Quick Pickles are the answer to a summer bounty of vegetables. 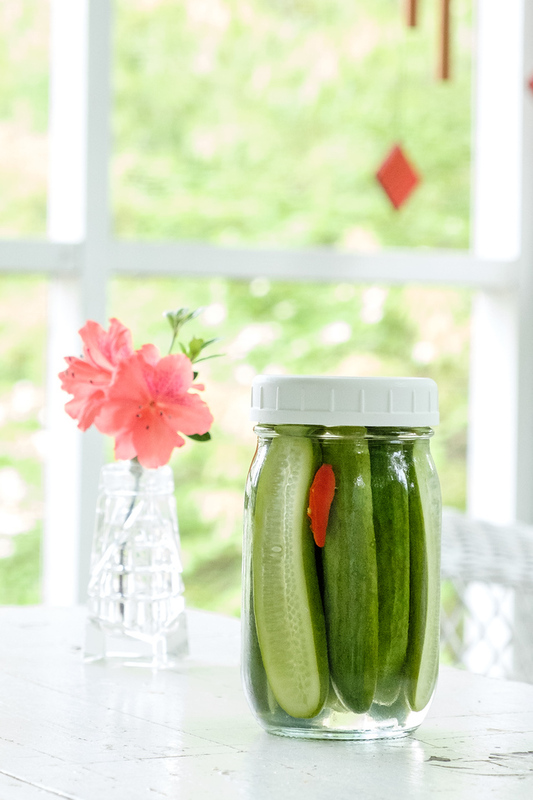 These Spicy Quick Pickled Cucumbers are so easy and delicious, you’ll want to have a jar in the fridge all summer long! No canning is necessary! Post may contain affiliate links, full disclosure in side bar. I belong to a CSA and sometimes during the summer I find myself overwhelmed with all the veggies that I am getting. While I like to regular can some of them, sometimes I just don’t have the time or the energy to bring out all the canning stuff. That’s where quick pickles are a lifesaver! Click here to pin these Spicy Quick Pickled Cucumbers now! Quick Pickles are the Best! Quick pickles are basically pickles that you don’t can. 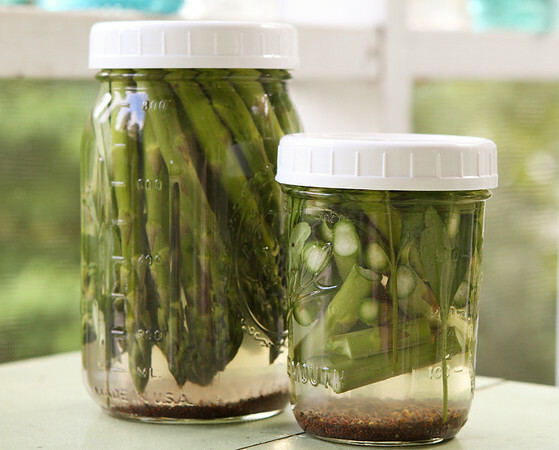 You store them in the fridge, where they will typically keep for two weeks to two months. Mine never last very long. 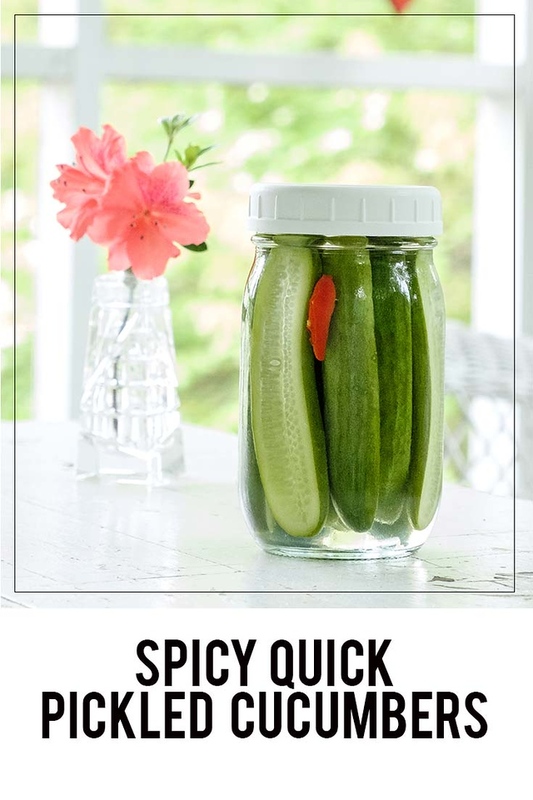 Quick pickles are perfect for snacking, garnishing sandwiches or salads and served with grilled meats, fish or poultry. Spicy Quick Pickled Cucumbers are so easy! With quick pickles you don’t have to be quite as precise as you do with regular canning. You are not trying to preserve them for a long time, just long enough for you to get around to eating them. Some have you heat the brine and some don’t. I’ve tried both ways and honestly I can’t tell a difference. I think if you want the veggies to soften a bit, then pouring over a warm brine will help. With these cucumbers, I just shook all the brine ingredients in a jar and poured over the cucumbers. Easy peasy. They’ll be tastier if you let them sit in the fridge for a couple of days before eating. My favorite sources for pickling recipes: The Joy of Pickling, The Quick Pickle Cookbook, and DIY Pickling. I also recommend Mason Jars and Plastic Lids. These spicy quick pickled cucumbers are so easy and delicious! 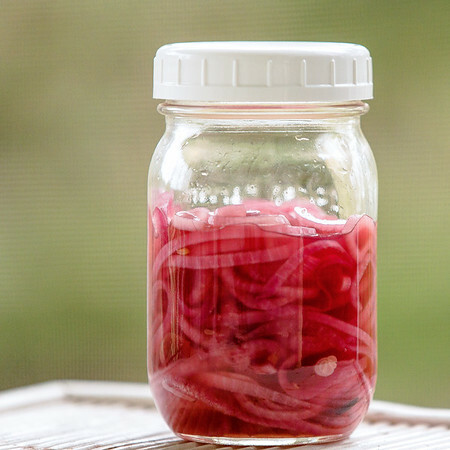 Sterilize a one quart jar with a lid. Pack the cucumbers into the jar and add the two hot red peppers. In another jar combine the vinegar, honey and salt. Shake to combine. Pour over the cucumbers and peppers. Cap the jar and store in the fridge overnight. Best if eaten within the week. These have just the right amount of heat, but we’re too vinegary for me. Would double the honey next time. And I definitely kept them in the fridge for more than two weeks. Still crunchy! Thanks for the recipe! I like mine extra vinegary, so I should probably make a note of that on the recipe! These look so fresh and tasty!